Few places on Lake Superior have the same mysterious appeal as Michipicoten Island. Maybe it’s the “floating isle” chimeric tendencies, appearing and disappearing at the whims of the weather. Ojibwa revered the island for its shiny lodes of copper and abundant populations of beaver and woodland caribou, and feared the fickle gulf of water that separates it from the mainland. When the swell rhythmically collides with the red gravel beach on Michipioten Island’s western tip, there’s a palpable sensation of being close to Lake Superior’s beating heart. The swirling mists of Michipicoten. The lucky paddlers who have explored Michipicoten Island will tell you that sheer isolation is at the core of its intrigue. Making the 16-kilometre crossing to Michipicoten by sea kayak isn’t for the inexperienced. Naturally Superior Adventures self-supported Michipicoten Island expedition puts this enchanting place within reach of strong intermediate sea kayakers, or experts who prefer travelling in the safety of a group. We’ll take a boat shuttle to Michipicoten Island’s East End lighthouse, circumnavigate the island and then cross back to the mainland and follow the Superior Highlands coast to Michipicoten Bay. Do you have what it takes? Paddlers should be comfortable paddling in one-metre seas (3-foot waves) and winds of 20 kilometres per hour (15 mph); have refined and well-practiced group and individual rescue skills (an eskimo roll is an asset; and have the stamina to sit comfortably in their boat and paddle up to 20 kilometres without a shore rest. You’ll also be responsible for your own menu planning and meal preparation, so be sure to polish these skills in advance. It follows we assign this trip to our most skilled and knowledgeable guides—veteran Paddle Canada instructor-trainers with extensive open water experience. 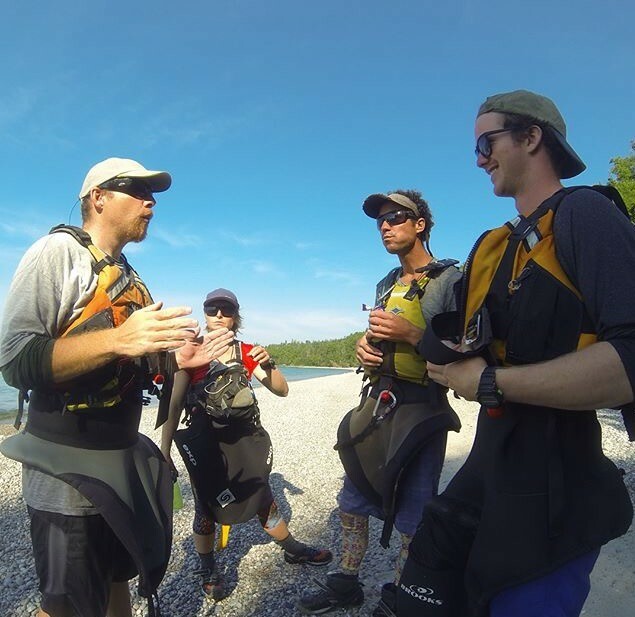 The result is paddling skills mentorship, great camaraderie and a one-of-a-kind experience in some of the most isolated coastlines on the entire Great Lakes. Two hundred years ago, when dozens of 36-foot birchbark canoes plied the water of Lake Superior, the paddler with the best set of lungs and a musical ear held a place of honour. Leading the crew in French Canadian folk classics like “En roulant ma boule” and “A la claire fontaine”, le chanteur—the singer—was responsible for setting the paddlers’ steady pace that carried the voyageur brigade to the trading post at Fort William, stroke by stroke. By dint of his musical ear, this canoeman often earned a higher wage. The voyageur canoe is designed for safe, efficient travel on Lake Superior. 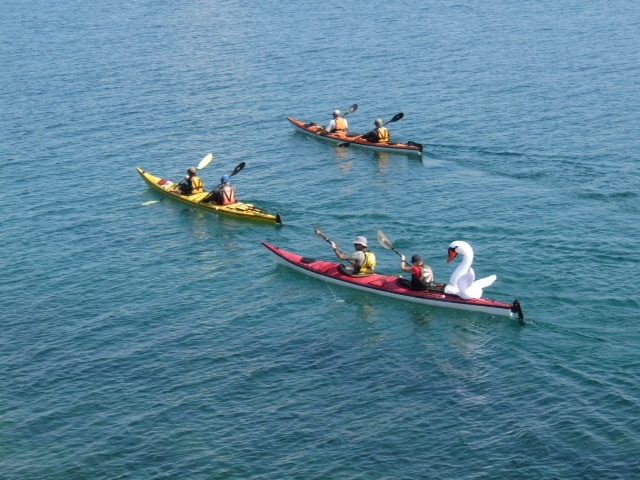 As paddlers, hikers and highway drivers, we all know the benefit of song in making hours of repetitive activity pass by. For days, I’ve timed my sea kayak stroke to the tempo of Dire Straits and Bachman-Turner Overdrive, the lyrics of “Walk on by” and “Taking care of business” looping endlessly through my mind. Author and canoe historian James Raffan notes that most of the voyageurs’ chansons are set in six-eight time—a fast tempo that mirrored the paddlers’ 60 strokes per minute pace. You need not maintain such a blistering stroke rate to join a voyageur canoe trip with Naturally Superior Adventures. In fact, our replica 36-foot canot du maître is suitable for all ages and experience levels. Fast and seaworthy, the voyageur canoe cruises effortlessly even with a crew of novices (and an experienced guide). For an authentic voyageur experience, sign up for our annual five-day all-inclusive, guided journey to the Red Rock Folk Festival. You’ll share the canoe with Canadian folk music icons, such as Ian Tamblyn, Rodney Brown and Katherine Wheatley. Not only will our musical guest set the perfect paddling rhythm, they’ll also entertain with intimate campfire performances as we trace the wilderness coastline of the Lake Superior National Marine Conservation Area in northwestern Ontario. Nearly a century has passed since some of Canada’s most famous landscape painters rode the rails deep into the wilderness of northern Ontario and defined an iconic style of art. Between 1918 and 1922, Lawren Harris, J.E.H. MacDonald, A.Y. Jackson, Arthur Lismer and Frank Johnston—members of Canada’s legendary Group of Seven—traveled on the Algoma Central Railway and sketched the rugged hillsides, waterfalls and autumn colors of Algoma, just north of the Great Lakes. They spent their days sketching from canoes and hiking to elevated viewpoints. MacDonald’s “Solemn Land”, Lismer’s “Somber Hill, Algoma”, Harris’ “Algoma Waterfall” and Jackson’s “First Snow, Algoma” are the notable results of this definitive era of painting. Placid water in the Agawa Canyon. Whitewater canoeing on the Agawa River. Today, many Group of Seven painting sites can be easily identified in the 500-foot-deep Agawa Canyon. Bridalveil Falls, the subject of works by Harris and MacDonald, is easily visible from the windows of the passenger train. Canoeists can paddle right up to the cascade, which tumbles from the canyon rim, for a more intimate glimpse. Just downstream, opposite the tracks on the Agawa River’s infrequently visited east shore, are the remains of a logging camp. Inscriptions on rocks suggest loggers and their families used the camp in the Group of Seven era. 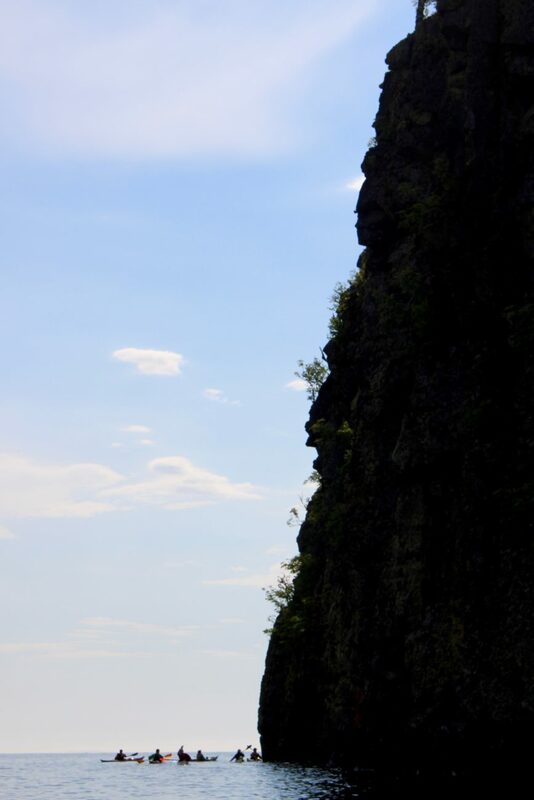 For all their exploration of the Agawa, it seems like the painters missed the river’s greatest highlight. The 80-foot plume of Agawa Falls spills into a rockbound gorge, bathed in perpetual mist. Today, it’s the scenic reward for paddlers (the falls is bypassed via a steep 500-metre portage) and hikers on the Towab Trail. Environment Canada’s Water Office has taken some of the guesswork out of planning a canoe or kayak trip on Lake Superior’s best whitewater rivers. 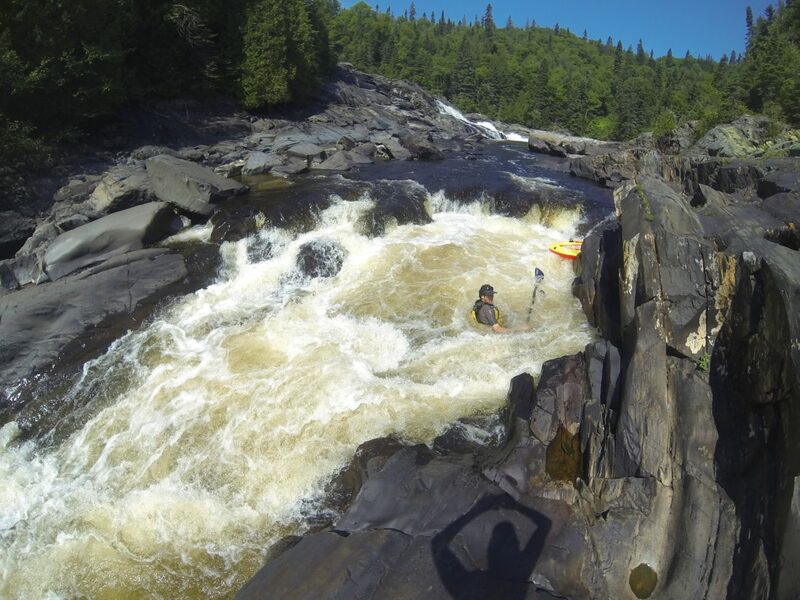 Real-time water level gauges on the Goulais, Batchawana and Pukaskwa rivers enable paddlers to capture perfect spring flows and make the most of heavy rain throughout the paddling season. 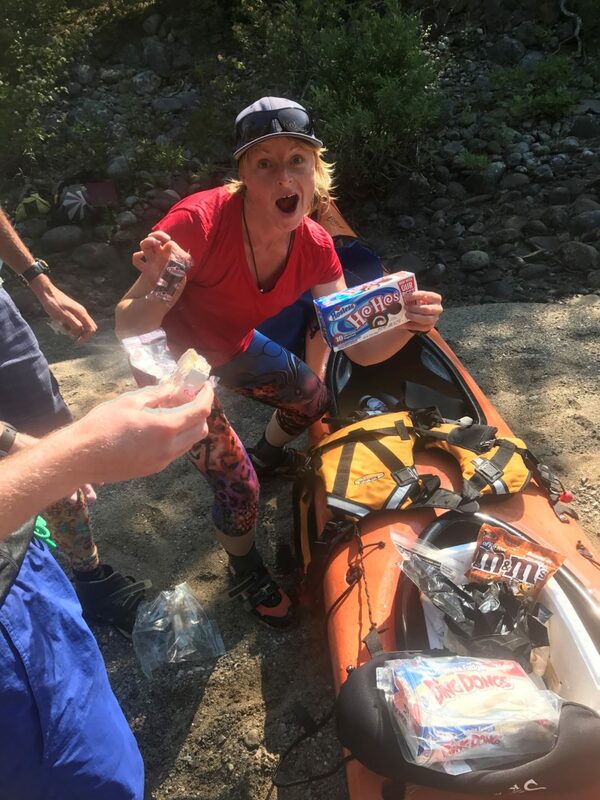 We’ve drawn on our experience paddling the Goulais, Batchawana, Agawa, Sand, Dog and Pukaskwa rivers to come up with the following guidelines for a good trip. Goulais River: Access north of Searchmont on the gravel Whitman Dam Road for single-day, overnight and multi-day trips. North of Searchmont, the Goulais is an intermediate to advanced river. The portages are not maintained and are often located very close to the brink of large rapids and waterfalls. The lower Goulais, from Searchmont (from Highway 556 to the bridge on Highway 552) is a novice-friendly run with a mix of Class 1-2 and flatwater. Batchawana River: Access via the Algoma Central Railway (Mile 80). It is a 2-3 day trip to the take-out at Highway 17 (Lake Superior), 70 km north of Sault Ste. Marie. The Batchawana features Class 1-3 rapids and several portages around chutes and waterfalls. Agawa River: Access via the Algoma Central Railway (Mile 114). It is a 1-2 day trip to the take-out at Highway 17 (Lake Superior), 130 km north of Sault Ste. Marie. 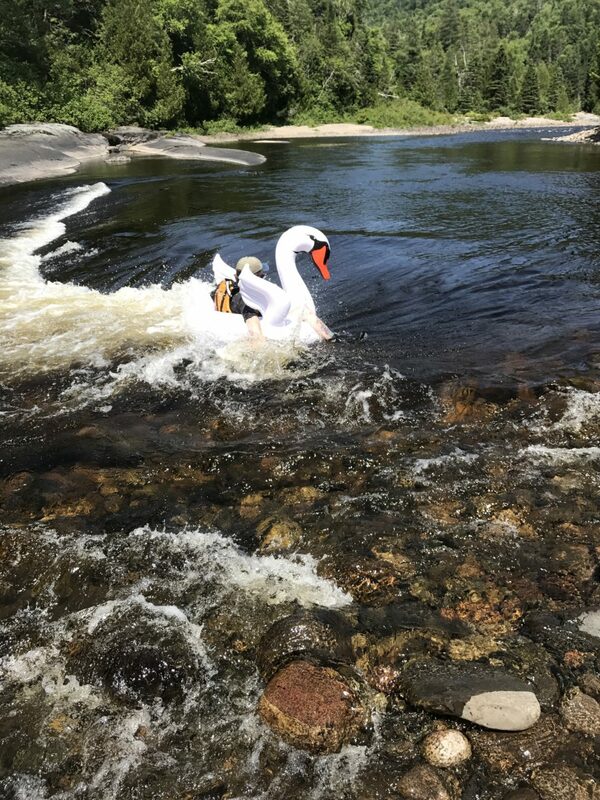 The Agawa features Class 1-4 rapids and up to three portages, depending on water level, skill level and whether you’re paddling a canoe or whitewater kayak. Prime Water levels: Use the Batchawana River gauge, 2.5-3.2, minimum 2.3. Note the Agawa is a smaller watershed and will “dry up” quicker than the Batchawana in spring and after a heavy rainfall. Sand River: Access via the Algoma Central Railway (Mile 136.25 or Mile 138) or via Old Woman Lake (Lake Superior Provincial Park). It is a 4-5 day trip to the take-out on Sand River Road, located just south of the Sand River mouth (145 km north of Sault Ste. Marie). The Sand features Class 1-3 rapids, several scenic waterfalls and lots of flatwater. Intermediate-skilled canoeists will need to make 18-20 portages. Prime Water levels: Use the Batchawana River gauge as a rough estimate. Anything above 2.5 should be adequate. Dog River: Access via Paint Lake Road (3-5 day trip) or Hammer Lake (6-7 day trip), finish at Michipicoten First Nation or Naturally Superior Adventures; includes a 20-28 km paddle on Lake Superior. The Dog is an advanced-only river for experienced whitewater kayakers and canoeists. Expect numerous unmaintained portages. Paddlers who are not capable of running Class 3 rapids should not attempt the Dog River. Prime Water levels: 4.5-5 on the Pukaskwa River gauge is adequate. Note the Dog River tends to “hold its water” longer than the Pukaskwa River during spring runoff. Pukaskwa River: Access via the Domtar 600 Road, off of Paint Lake Road. The traditional means of access involved paddling Pokei Creek (launch on the upper White River), however intermediate road access means these portages have fallen into disrepair. It is a 5-7 day trip to Lake Superior and a 90-km paddle north to Hattie Cove (Pukaskwa National Park) or south to Michipicoten on Lake Superior. (Boat shuttles may be available—contact Naturally Superior Adventures for more information.) The Pukaskwa River features intermediate-level whitewater and extreme remoteness. Expect lots of rugged portages—especially on Day 1. Ringham’s Gorge is runnable by advanced paddlers in moderate water levels. Prime Water levels: 4.6-5.2, minimum 4.5. Contact Naturally Superior Adventures for information regarding vehicle shuttles for the Pukaskwa, Dog, Sand and Agawa Rivers. There’s a reason the Slate Islands are a perennial favourite amongst Naturally Superior Adventures guests. Paddling this archipelago located 10 kilometres off the north shore of Lake Superior offers the perfect mix of sheltered paddling and exposed coast, amazing flora, fauna and geology, and rich human history. If you’re looking for a novice-friendly trip that captures the best of Lake Superior, the Slate Islands is it! 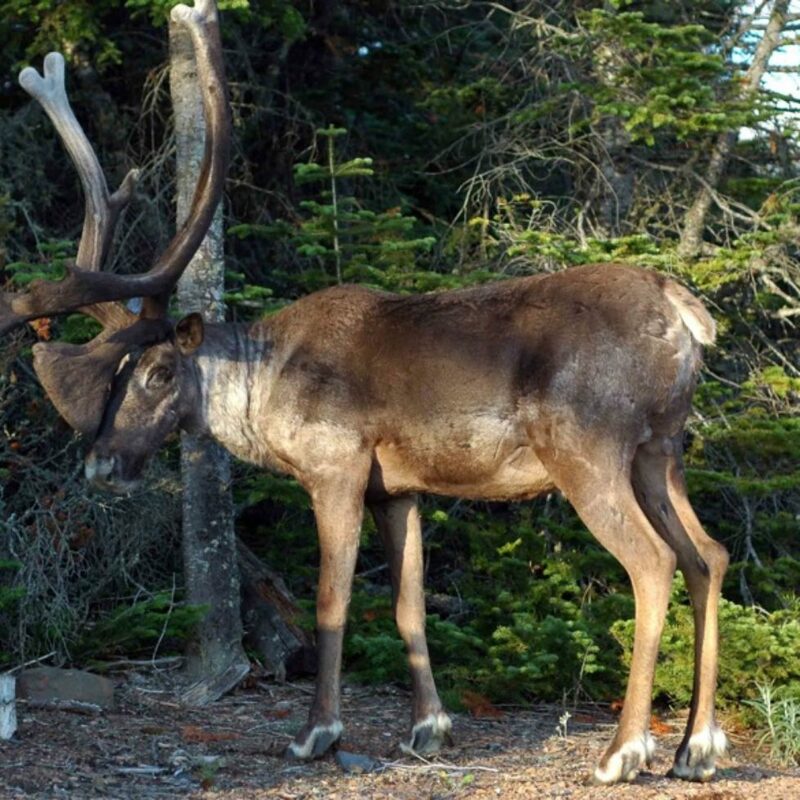 Woodland caribou, an endangered species, are common at the Slate Islands. Paddling conditions: Evidenced by their donut-like shape, the Slate Islands were formed when the Earth’s crust rebounded from a meteorite impact 500 million years ago. This unique landform produces perfect paddling conditions: The islands’ parentheses-like shape creates bombproof shelter for calm-water paddling in all conditions within the inner islands, while the outer coast features rugged headlands and broad gravel beaches—testaments to Lake Superior’s powerful autumn storms. Regardless of the weather, there’s always paddling to be had. Cruising the outer coast of the Slates, under the gaze of the Slate Island lighthouse. Natural heritage: The Slates are best-known for woodland caribou, a species at risk in Ontario. Because of the islands’ isolation, a remnant population of caribou still inhabits the Slates. Numbers vary from 100 to 600 animals, related to the boom and bust cycles of vegetation. This “closed system” has given wildlife biologists a natural laboratory to study population dynamics. Certain arctic/alpine plant species, including mountain avens, encrusted saxifrage and birds-eye primrose, also thrive in the Slates isolation. That’s because Lake Superior’s perpetually cool waters create a microclimate for these cold-adapted species, whose lineage dates back to the last ice age. Meanwhile, rockhounds can’t get enough of the Slates’ unique geology—including flaky, slate-coloured rocks known as “shattercones” (formed by meteorite impact) and abandoned gold and copper mines. Encrusted saxifrage is an arctic/alpine plant typically found 1,600 km north of Lake Superior. Cultural history: Adolph King, the son of Slate Island lighthouse keepers, told colourful stories of growing up on Patterson Island at the turn of the 20th century. King and his brothers regularly made the 10-kilometre crossing to the mainland town of Jackfish, then a bustling railway town, by rowboat. Often, the boys returned to their island home in darkness, steering by their wits and the woefully inadequate light of a kerosene lantern. The King’s lighthouse still stands sentinel on the Slate Islands’ south shore, offering modern-day visitors a glimpse of a long-lost lifestyle. Read adventure bloggers Dave and Deb’s (aka The Planet D) report on their adventures at the Slate Islands. There’s good reason Lake Superior is renown as a paddling destination: The options for sea kayaking and canoeing combined with spectacular scenery and isolation make it world-class. But the day-hiking and long-distance backpacking trails of the North Shore are equally diverse and capture the best of the wilderness coast from a different perspective. Setting up camp on the Lake Superior coast. As much as the trails of Newfoundland’s Gros Morne and British Columbia’s Pacific Rim national parks have been lauded as Canada’s finest backpacking, with recognition comes crowds. Along the secluded trails of Pukaskwa National Park and Lake Superior Provincial Park you’ll experience an inland sea you’d swear was an ocean, until you taste its sparkling clean fresh water. Spectacular sunsets are the rule on the Pukaskwa coast. Pukaskwa’s Coastal Trail stretches 60 kilometres along the most isolated section of Lake Superior coast. It’s so remote that no roads service its southern end; to make it a one-way hike, most adventurers hire a boat shuttle to North Swallow River and trek north to the road-access visitor centre at Hattie Cove. This five- to seven-day hike features seriously rugged terrain—with copious brown sugar beaches and stunning views to make you forget the sweat and toil. If you’re less experienced or simply wanting a richer, more interpretive experience, sign up for a guided trip with Naturally Superior Adventures, like adventure travel bloggers the Planet D did in the summer of 2014. Lake Superior Provincial Park also boasts a 65-kilometre-long coastal backpacking trail. But perhaps its greatest attribute is a wide array of day hikes, easily accessible to guests at Rock Island Lodge. Favourites include the five-kilometre-long Nokomis Trail, which offers outstanding views of Old Woman Bay, and the eight-kilometre-long Orphan Lake trail, which passes through an old-growth yellow birch to a wave-washed gravel beach on the Lake Superior coast. The Wawa portion of the Voyageur Trail features waterfalls and wildflowers, and the trailhead is within walking distance of your room at Rock Island Lodge. Click here for a map of day hiking, weekend adventures and multi-day backpacking trips on Lake Superior’s north shore. While mining activities on Lake Superior have targeted commercially valuable minerals like gold, silver and copper, sea kayakers know there’s more that glitters on the coast. Polished stones at Slate Islands. Migmatite – Wavy folds of quartz take shape on smooth sheets of pink granite, revealing the blend of metamorphic and igneous rock that defines this formation. Migmatite is created when quartz and gneiss partially melt and flow into igneous rock, and then recrystallize (solidify) in a marbled pattern. Where to see it: Agawa Bay (Lake Superior Provincial Park), Oiseau Bay (Pukaskwa National Park). Agate – The glassy face of a piece of water-polished agate reveals endless patterns of soft, muted colours. Agate is typically found in volcanic formations, created when silica-based minerals such as quartz were heated and then crystallized in pockets contained in lava rock. An agate’s concentric rings demonstrate the cooling process. Where to see it: Gargantua (Lake Superior Provincial Park), Michipicoten Island, Simpson Island (Lake Superior National Marine Conservation Area). Columnar basalt – So-called “columnar jointing” of volcanic rock occurs only under specific environmental conditions. To create a “beehive” formation like the Giant’s Causeway in Northern Ireland, a lava flow cooled and settled in a similar manner to drying mud, creating vertical hexagonal fractures. Columnar basalt at Simpson Island.